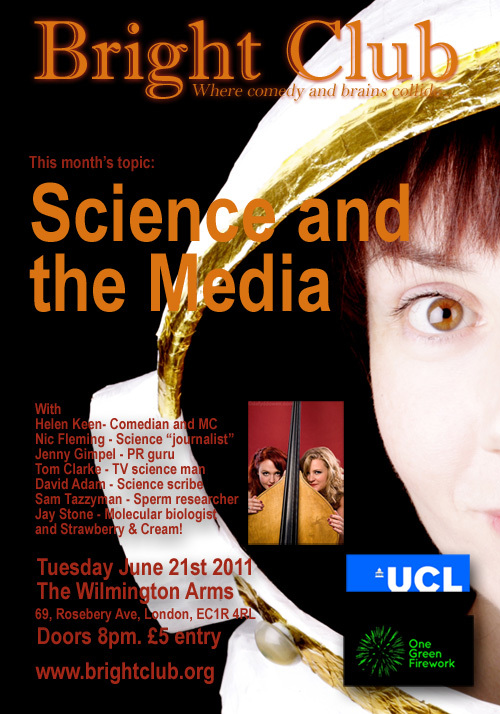 For the first time ever Bright Club, London’s clever variety night where all sorts of people get to make jokes about their work, is going to take on science and the media in one go. Helen Keen – MC, compere, referee, writer and performer of Radio 4’s It Is Rocket Science. So funny that she can’t be called a “science comedian”. She’s more of a “comedian”. Strawberry & Cream – the most delicious cabaret band this side of Planet Ice Cream. Two girls, two double basses and a lot of filth. Trying out some new science material. Maybe. Nic Fleming – Science journalist and author of “Sorry darling, I can’t do the vacuuming. It might damage my sperm count: The best excuse yet for men not to do the housework…” and “Horses can count, new study says”. Tom Clarke – Channel 4 News Science Correspondent. Sensible enough not to have articles with funny titles that can be easily found via Google. David Adam – Environment journalist and author of “Spike-nosed tree frog and tame woolly rat found in Indonesian New Guinea” and “Iceland volcano causes fall in carbon emissions as eruption grounds aircraft” (how topical!). Sam Tazzyman – researcher into reproductive strategies and sperm production. Inspirer of many incredible headlines. Jay Stone – molecular biologist, science writer, inspirer of design and NOBELini winner. If you’ve read this far, could you go and ‘LIKE’ Bright Club’s new Page on Facebook? GET YOUR ADVANCED TICKETS TO ENSURE YOU GET IN! This month Bright Club is two years old. Can you believe it? In that time we’ve run more than twenty-five gigs, hosted more than a hundred speakers, enjoyed the company of more than 3000 audience members, grown into two new cities and had more than five hundred rounds of applause. So we’re celebrating in style, by inviting some old friends to share sets old and new, and to keep us up to date with the latest humorous happenings in their fields. Steve Hall is back as MC after holding our last Bloomsbury Theatre sellout together. He knows Bright Club inside-out, and will probably be wearing his glasses to try and look scholarly. You might have heard Jason Dittmer on a recent podcast. He works on Captain America and the apocalypse, on the antichrist and Alan Moore. He’s a human geographer (so no colouring in). Laura Ishiguro reads other people’s letters. She’s studying correspondence between frontiersmen (and women) and their families back home. She’s a great source of vintage culinary, etiquette and dating advice! Joe Flatman examines ships for violent and sexual iconography and checks for exciting objects before anyone builds in Surrey. He’s an archaeologist, but of the cool metropolitan variety, rather than a beardy Time Teamer. Ask him about Bone Kickers. Please ask him about Bone Kickers. Mike Page is a reader in Psychology at Herts University and a Bright Club debutant. He’ll pick your brains apart then put them back together. Matthew Robinson speaks to dead people. Well, he reads their poetry anyway, in the department of Greek and Latin. The thinking woman’s favourite pianist, Colin Hazel, will be tinkling the ivories and singing the songs that make the whole world sing. 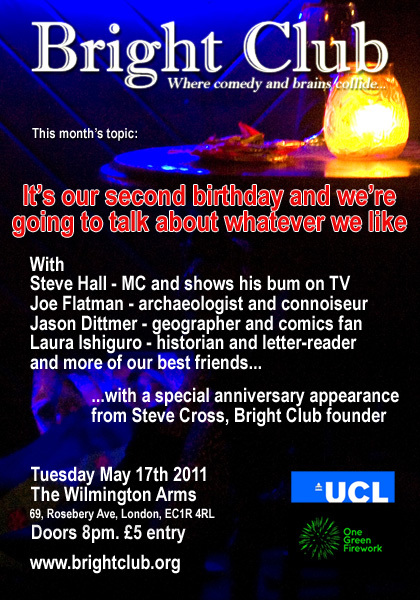 As a special treat we have an anniversary appearance from Steve Cross, the voice on the Bright Club podcasts. He’ll be telling you all the stupid things that happen when you run a comedy club that people who’ve never been don’t understand for two years. Wilmington Arms. Five pounds to get in. Doors at 8pm. May 17th. What more do you need to know?